Mum wanted to try harder with the cat art this week but she ran out of time as she is busy writing a new cat book. We appreciate you all joining us every week for our Caturday Art blog hop and always look forward to seeing your wonderful creations. Wishing you all a very Happy Caturday! Pawsum foto Athena. Fanks fur havin' da Caturday art blog hop fur us to join. It still looks very cool, even if you did do it quickly! That's a neat effect. Besides seeing all the creative pictures people share, I like learning the new online tools that are available. Athena, even if your Mom did do it fast, yous looks marvelous Darling! It's marvelous - love the eyes! For a quickie, it looks pretty cool. Thanks for hosting the hop. Wow, we really love that effect and art photo! Happy Caturday! I think your picture looks cool ! My mom have run out of time too this week , she had to work a lot since she was away the week before. That's lovely!!! Cool....another site to check out too! Thank you. Thanks for participating! 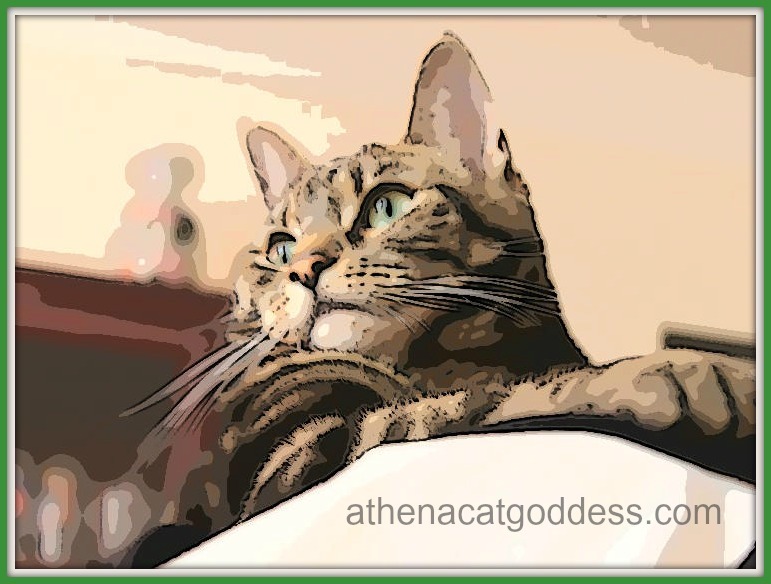 Athena you look fantastic and love your artsy effect! Yay! I used a cartoon effect with far different results. Yours came super with the eyes standing out. Thank you. Yours is great too!